This classic cruiser is well laid out and feels incredibly spacious for her footage. The cockpit is massive, and the flybridge looks very comfortable, perfectly set out ready for a cocktail on the lounger. She has a range of features including an inverter for 240v, radar, the cockpit cover was new in 2016 and still looks in great condition, the galley is fully equipped, and the master cabin is a good size. She was anti-fouled in 2017 but could do with a touch up here and there, and the teak was last reconditioned in 2016 but again could do with a going over in a couple of spots. The engines look in good condition although I have not started them as she is on the hard. This would be a great boat for weekend cruising, coastal trips, fishing trips, She could easily handle passages over to Ireland or France as she has more than enough engine power for longer legs, or just a lovely spot to enjoy a G&T in the sun on the flybridge. 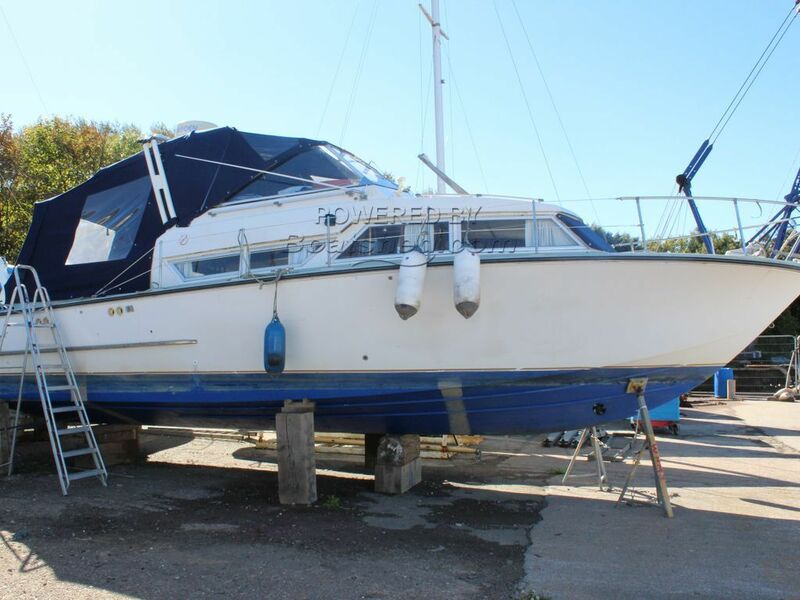 The currently owner is selling due to the purchase of a new boat. This Coronet 32 Oceanfarer has been personally photographed and viewed by Oliver Yates of Boatshed Bristol. Click here for contact details.